Since its inception in 1974, Fluid Automation, Inc. has been at the forefront of developing and building state-of-the-art dispensing equipment for RTV and LSR materials. The company was launched with the development of the first “direct-from-the-drum” pumping system for RTV materials. The immediate success of this endeavor established his company’s reputation for innovation, quality and exceptional customer support. Fluid Automation has always been an industry leader and established itself early on as a partner with its customers. Based on Fluid Automation’s success with its 10:1 RTV machines, the company was asked to develop the industry’s first systems for dispensing 1:1 LSR materials. 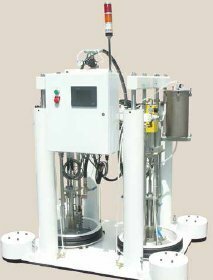 The patented, hydraulic slave drive system was the beginning of an ever evolving product line that now includes PLC-controlled closed-loop metering units, transfer and metering systems, electric-servo motor operated metering machines, table-top cartridge dispensing systems and all pneumatic machines. Rounding out the product offerings is a complete line of LSR injection molding accessories including LSR injection nozzles, water-cooled material pressure regulators, material filter packs and a variety of static mixer sizes and styles. In 2013 the company was acquired by Graco and has since been relocated to Graco’s Advanced Technology center in North Canton, OH. Key members of the Fluid Automation design and sales teams have been retained and are still developing and supporting the product. As the product line becomes more integrated with Graco, we will be introducing new products and advancements. You can now order parts for your new and legacy Fluid Automation machines and accessories through our on-line store right here! As the exclusive distributors for Graco and Fluid Automation, we offer local support and sales for the equipment in CT, MA, RI, ME, NH, VT, NY, NJ and PA.